The Alliance Tournament, The Syndicate Competitive League, The New Eden Open. All of these are perceived as THE tournaments in EVE. In fact, to many there are no others. However, take a look at the in-game events forum and rarely does a week go by without someone trying to organise a tournament of some sort, especially with the advent of the duel mechanic. Sometimes they succeed, most often they do not. On the other hand, many more tournaments go unnoticed as they happen (successfully) within the confines of corporations and alliances, where like-minded players test their mettle against one another for prizes, bragging rights and glory. It will come as no surprise to learn that this has been done in RvB as well. Over the past five years our members have organised ad hoc tournaments and similar events, but it was not until this year that I decided RvB should “go large” as it were, and create our own major tournament series. This series began in March with a rather low-key event organised by one of our FC’s, however it really did not take off. The seed of the idea stuck with me though, and using my event pedigree and organisational skills, I hosted the RvB Spring Cup a few months later. This was the first major internal tournament I had ever hosted and it went so well that I had to repeat it for RvB’s fifth birthday celebrations. 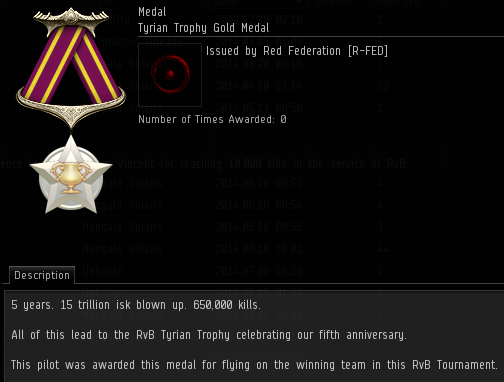 And so the RvB Tyrian Trophy became a reality. Teams consisted of a maximum of five pilots. Given RvBs nature, pilots signed up in a thread, then I assigned them to pre-arranged team captains a few weeks prior to the event. 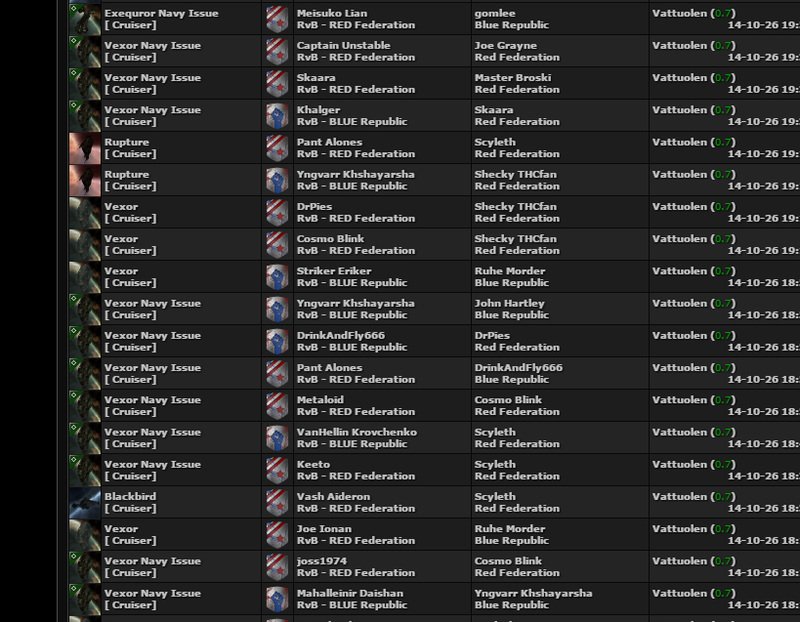 Every team was as well balanced as I could make them using a combination of RNG websites, and my knowledge of their overall experience of both pvp and EVE itself. While RvB is a large active entity, we are very casual in nature so a limit of 16 teams was imposed for this tournament. Unfortunately, that same nature caused a couple of teams to either fall apart before the event, or found themselves unable to fly on the tournament weekend itself. The result was the Tyrian Trophy ran with 15 teams in total, with the 15th team having had two days to prepare, unlike the three weeks granted to everyone else. The major tournaments use a points system to govern both scoring of matches, and determine what ships teams would be able to field. The Tyrian Trophy used a similar system, although we granted teams less points, specifically 33 points, and a limited pool of available ships was decided upon. As you can see nothing larger than battlecruisers was permitted, making the tournament affordable for all, and more in line with the public perception of RvB. Much like the AT, SCL and the NEO, this was a double elimination tournament. Each of the teams would fight a minimum of two matches unless granted a bye. The teams that reached the finals would have fought 10 matches in total over the weekend. Several things that are taken for granted in the more well known tournaments were banned from this event, including pirate implants and ammunition, as well fleet boosts in the form of command ships and mind links. ECM and remote repair, while being very underutilised in RvB, were allowed but limited to specific ship types. Following RvB tradition podding was also prohibited, but this is also the case in the major tournaments. We even managed to create our own rule on boundary violations, which I thought would be very hard to work out without the diligence of Veritas and his obsession with boundary violations! Most notably, we took the ship banning system used in the AT and added it as a mechanic in the later matches on the second day. RvB does not quite have CCP’s budget when it comes to Tournaments. Although that does not stop us from trying. The prize pool for the Tyrian trophy was an an epic 40 BILLION ISK in prizes ranging from Pirate battleships, Navy cruisers, and Police Pursuit Comet skins to in-game medals. These prizes were made possible from funds donated by RvB, RvB members and myself. In previous RvB events, prizes were normally awarded to a limited number of event participants. Winners if you will. Once again, following the example set in ATXII, we ensured that many more participants could win prizes, in fact the top 8 teams would all walk away with something. As I discussed above many tournaments are run successfully due to being away from the public eye, however this approach is not one RvB (or me) would take. All of our major events have to have an element of flash to them. In the case of our Tournament series, two out of three have been live streamed on the RvB twitch channel, and featured full match commentary. 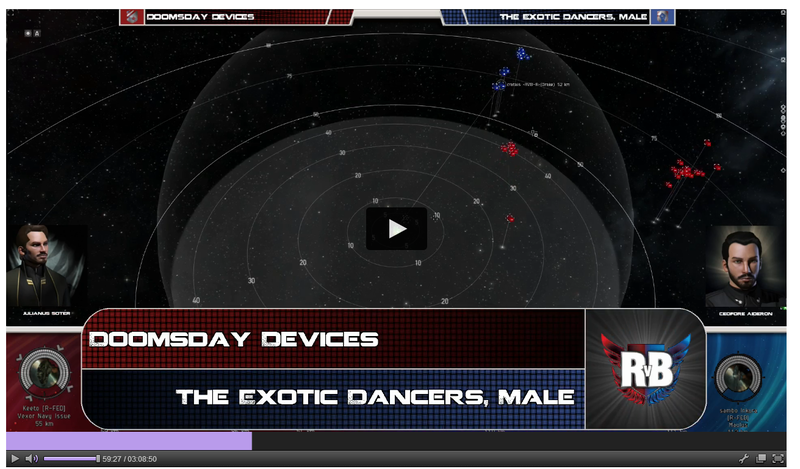 The Tyrian Trophy was the second time we have streamed an event of this magnitude. During the Spring Cup we enrolled Ceofore Aideron, Connall Tara and others to commentate for us, while the streaming was undertaken by (Tyrendian) Biohazard. I found the coverage and the commentary to really help make the Spring Cup the success it was. So much so that when planning for the Tyrian Trophy began, I approached both Biohazard and Ceofore immediately to let them know their services would be required once again. As you can see from the screenshots below, thanks to Biohazards excellent work handling our production efforts, it was possible to display hit points, ship types, commentator names, team names and, in the latter stages, even ship bans. This gave the tournament a polished, professional look very reminiscent of the early days of the Alliance Tournament. The Tyrian Trophy was held the weekend after EVE Vegas, as a consequence of which I felt rather stressed when the weekend began as so many eggs were missing from my basket in terms of missing pilots, teams falling apart, AWOL commentary staff and even the arena yet to be created. Once the event got going though, the stress just melted away. The three key parts of the event came together in such a way to make me proud of all the work myself and others had put in over the preceding months. The commentary team of Ceofore Aideron, Julianus Soter, Sard Caid and Thecla Elarik demonstrated their extensive game knowledge when it came to keeping the audience aware of exactly what was taking place in the matches. The stream itself, thanks to Biohazard and his “cambots” (UHURT pilots: Boci, Dale Gaterau, BlackwingDMG, noXza) was an order of magnitude better than the Spring Cup, with very few technical problems. As for the fights, they really showed off RvB at its finest, even when it seemed like every team had fallen in love with the Vexor Navy Issue. As well as featuring full match commentary we had a show of sorts going on to keep people focused between matches. This show was hosted by RvB’s former AT captain, Xan Drakov along side myself. We chatted about the event, my lack of time to eat, EVE in general and occasionally added banter from the commentators thrown in for a little colour. Wherever we could, we tried to get the audience involved, from getting them to mail in questions, or answering those asked in the stream chat, to having them vote for their favourite team on each day of the tournament. Some thanks has to go to CCP here as CCP Manifest saw the tweets we put out on this, came into the stream chat, then worked Social Media magic and BANG, our audience shot up and interest in the whole event really spiked. The tournament attracted a lot of viewers considering the content was a niche event featuring high sec pilots; in fact on the second day we had several newbies turn up in the stream chat with lots of EVE related questions, and the audience really made them welcome, even to the extent of converting a DUST player into an EVE player. I spent the majority of the weekend cloaked 200km above the arena, watching the matches live on one screen and ever so slightly delayed (but with commentary!) on the other. I was very impressed with each and every match due to how well the teams had meshed together, despite time zone issues, pilot experience levels and even general playstyle differences. Particularly the pilots on Team Jigsaw, who had been thrown together two days prior to the tournament, with the scantest of notes from former captains on which ships to use and how to best utilise them. Over the course of the weekend, several matches really grabbed my attention, especially the following matches from the first day: First up was the second match, in which Doomsday Devices (DD) faced off against The Exotic Dancers, Male (EDM). DD brought a double VNI setup against a double Drake setup fielded by EDM. I, and the audience, expected the Drakes to take it. We were wrong. DD won the match with a clean sweep. Little was I to know that VNIs would become so ubiquitous in this tournament. The sixth match between P.W.N.T (PWNT) and Speshul Snowflakes (SS) was an incredibly close contest. Both teams fielded dual VNI setups, however, SS added a couple of Inquisitors as logistics frigates. This match went so close. It was proper edge of the seat viewing. Some excellent piloting from both Yankunytjatjara and Paul Panala in those inquisitors really handed SS the win. Team Jigsaw’s first match was another highlight for me, mostly as they justified the faith I had in them before the tournament even started. Although, I think I eventually tired of seeing Bob Mississippi flying talwars all weekend more than I did of VNIs for everyone! In fact I recommend watching all of their matches. They really are that good. Way Too Tight brought a sentry Myrmidon setup with a couple of battle Nereus thrown in, to fight Rich Tea. You have to watch this match to know why I loved it enough to include it in my highlights. You can find the rest of the matches on Youtube. Day one is here, and day two is here. Going into the event, several teams were mooted as possible winners. Way Too Tight was captained by Lotta Vageena who runs some great small gang roams into low sec; Rich Tea had the almighty Yngvarr as captain; Gorski Car staged a coup and took over management of The Glass Soldiers; Samuel Vokan threw his all into shepherding the pilots of Shamefur Dispray. Glory eluded them all. Team Jigsaw, the team no one thought would win (except me, I had faith in them), really proved why tournaments in EVE can be so special. They came out of nowhere, having been formed barely 48 hours before the first shot was fired. Five players from both sides of the RvB divide who rarely fly with one another, coming together to win nearly every match they fought in, and usually against teams much better on paper or in terms of experience and SP. Now, such events are not all sunshine and rainbows, nor do they go smoothly all of the time. As the weekend progressed, it became obvious that when I created the rule that specified ship limits, I missed a trick. Namely that two VNIs PLUS Geckos would wreck nearly anything put in front of them in this format, more so if they were accompanied by two regular Vexors and flights of light drones. While the matches featuring these setups were still entertaining, I felt they could be better. So, I amended the rules on the fly and changed how and when ship bans would come into play. Rather than bans only being in the Final, I extended them out to the Semi Finals and the Losers bracket Final, with both teams in each of those matches able to ban one ship type each. Suffice to say, the teams went against my unspoken dreams and banned everything BUT the VNI. Worms, Maulus, logistic frigates, Myrms and many more all saw the ban stick from the wrong end. The teams were just TOO invested in the drone meta I had unwittingly created, to give it up. 41 VNI’s (45% of all cruisers lost) exploded to prove that point. I am already formulating ways to limit a single meta dominating like this in future events, it could be that faction variants are counted as part of the allowance of a hull type as a whole, or I could ban geckos and leave VNIs as they stand. Overall I think that extending the bans to more matches worked best even if the outcome was not quite what I, the commentators, or the audience had hoped. It certainly gave teams much to mull over the night before and right up their matches. One captain practically put his life on hold to purchase and fit a large amount of alternate ships and fits to counter for every ban he could imagine. Other teams simply grabbed ships between matches and prayed hard! For your average AT campaign teams can spend upwards of 40-50 Billion ISK, and just as easily lose all of that sum within a couple of matches, with nothing to show for it bar killmails in Jove space. Which means upwards of a trillion ISK can be lost across the entire event. The Tyrian trophy on the other hand saw around a combined total of 10 billion ISK lost by all teams that suffered at least one ship loss. Teams spent an average of 1 billion ISK each with a couple of outliers that did go ever so slightly crazy on their spending. 150 ships were lost over the course of 30 matches. 41 of which were Vexor Navy Issue’s, 9 of which were BCs, and only one of which was a T2 Logistics hull. The latter was surprising, as only two T2 logistics hulls were fielded across the event, and the second one caused some concern from the teams that faced it. As it would just not DIE! XL ASB Basilisks are win, who knew? I discussed earlier in this article that this event was held as the final part of the RvB fifth birthday events. However, it was not just held for that reason. 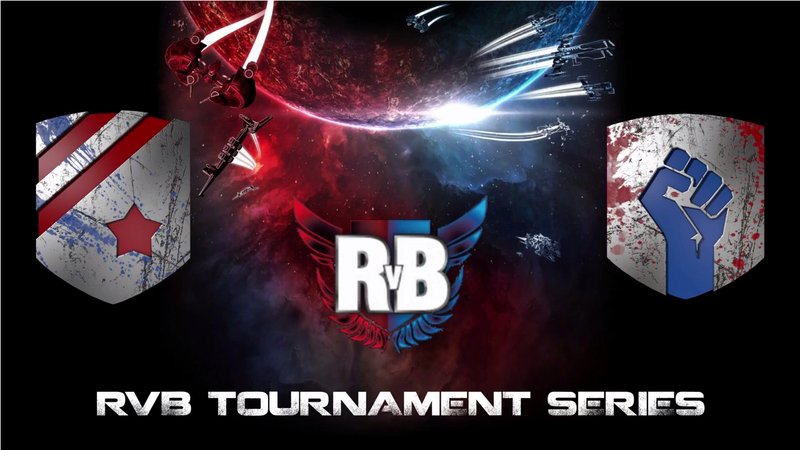 Ever since I hosted the Spring Cup I had wanted to run another tournament for RvB, mostly to prove that players can organise serious tournaments without any assistance from CCP on streams, event logistics or prizes. Best of all, they can be run in freely accessible space on TQ, with minimal to no interference from outside agencies. I think I have made my point. In fact, I hope that the framework I have set out in this tournament is used by others to create and produce their own PVP tournaments. Such events taking hold at a grassroots level is ultimately good for the major tournaments we all follow, as it leads to an increased player focus, and potentially more quality teams entering and winning those events. As for my own plans for the future, I am aiming to hold three tournaments a year for RvB. They will of course iterate on the ones that have been held previously, as well as continue to borrow mechanics from other tournaments I notice as I meander around the EVE community. Additionally I would like to expand the RvB Tournament Series to include one event a year in which other entities can take part. Currently the logistics of this are leaning towards use of war decs, the ally mechanic, a new forum hosted by RvB as a hub for coordination, and much more. For now though, I am focusing on getting things “right” by using RvB as my guinea pigs, and hoping that continued exposure to a tournament environment will turn into a larger pool of pilots for our future Alliance Tournament campaigns. In closing, I feel that player events such this will eventually tie in nicely with CCP Gargants goal for “esports” in EVE to become considerably more player driven than they are now.